Lying in the shadow of mighty Dhauladhar range is the quaint town of Dharamshala. Divided in two halves – Kotwali Bazar and the skirting markets make up Lower Dharamshala, which makes a dramatic transition in the upper reaches that has thick pine, cedar and Himalayan oak forests around the township of Mcleodganj. It is an 18 km gradual uphill drive from Kangra that gets you to Dharamshala. Mcleodganj serves as the capital of the Tibetan Government in exile. With rising altitude, the summer temperature between Lower and Upper Dharamshala changes from warm to cool climes. It was in the wake of the Tibetan uprising of 1959 that His Holiness the 14th Dalai Lama escaped from Lhasa. Choosing Mcleodganj for an abode in exile saw an influx of Tibetan population that followed him into exile. Often referred to as ‘Little Lhasa’ the vivid character of the city today attracts many famous people, including country heads, filmmakers and diplomats to Mcleodganj, Dharamshala from all over the world. Colonial influence, however, has its imprint intact in the town which can be spotted in many buildings, a church and other landmarks of the era scattered around the town and its suburbs. Language: Hindi, Punjabi, English are understood and spoken by the people engaged in tourism trade. Natives speak Kangri and Tibetan is spoken by the immigrant Buddhist community. Clothing Essentials: Lower reaches of Dharamshala experience higher temperature in summers whereas the upper region gets really cold in winters. Just like most hilly regions of Himachal, cotton clothes are preferable in summers and heavy woolens are needed for winters. The spring and autumn seasons with moderate temperatures are a good time to be in town. Air: Kangra airport at Gaggal is at a distance of 14 km from Dharamshala. There are regular flights between Delhi and Kangra to this airport. Rail: The nearest broad gauge railway line to Dharamshala is at Pathankot which is then connected by a 94 km narrow gauge line to Kangra. Road: Dharamshala is well connected by roads from all nearby cities. Both public and private transport buses regularly ply between Dharamshala to Delhi, Chandigarh, Pathankot, Kullu-Manali, Shimla and other destinations. Taxis for all places are readily available. Parking Locations: Hotel Bhagsu Car Parking, Parking of Mcleodganj and Community Hall Parking, Kotwali Bazar. There are plenty of things to experience in and around Dharamshala. Dharamshala owes its charm and character to the allure spun by the Mcleodganj. Dominated by the Tibetan community, the suburb at an elevation of 2,082 m is also referred to as mini Lhasa. The main street of Mcleodganj is sprinkled with Tibetan craft shops and amazing eateries serving fresh and savoury dishes cooked with a tinge of Tibetan cooking flavours. Major section of the market is centered around the Kalachakra Temple, bestowing good wishes on residents and tourists. Uphill from Mcleodganj, the scenic views get wider with rising elevation. Dharamkot is home to many foreigners and life in this small village is influenced by western lifestyles. This village is also the base for a trek to Triund, a scenic pasture land higher up in the mountain range. For those who visit the Bhagsunag Temple near Mcleodganj, an uphill walk to Bhagsunag Falls is a good place to unwind. This natural waterfall draws pilgrims and tourists to enjoy its sheer allure. The best time to be at the waterfall is in the rainy season from July to September when the stream is in full flow. A relic of the British Raj, the St. John Church in the Wilderness was constructed in 1852 and is set in a forest at Forsythg Ganj. Built in the neo-Gothic architecture style, much of the structure survived a devastating earthquake in 1905 which flattened most building in Kangra valley. Within its compound lies buried Lord Elgin, a Viceroy from 1862-63. The church has some fine Belgian stained glass windows. At Kotwali Bazar is the Kangra Art Museum, a treasure of art and history about Kangra valley and Tibetan culture. On display are more than 1500 artefacts and crafts, some dating back to the 5th century AD. It also has a fine collection of miniature paintings. There are sculptures, pottery and anthropological items curated with care on display here. Set amidst a beautiful pine forests with well laid out gardens at the gateway to Dharamshala is the War Memorial that pays tribute to the known and unknown soldier who have died in service of the nation. Streams running through well maintained Japanese styled gardens, birds fluttering about in trees and the vibrant Tibetan architecture of Norbulingka Institute does catch a visitors fancy. The institute was founded in 1995 by Kelsang and Kim Yeshi to preserve the Tibetan arts, crafts and culture. Norbulingka Institute at Sidhpur is 7 km from Dharamshala. Dwelling place of the Karmapa, a highly revered Tibetan Lama, in exile, the Gyuto monastery at Sidhwari near Dharamshala. Many Tibetan refugees and foreign tourists do visit this monastery. This temple is dedicated to the Snake god hill top at approximately 5 km from Dharamshala. The place offers a 360-degree view that scans the Dhauladhar ranges down to the city and beyond into the vast Kangra valley spread across. On the banks of Ban Ganga stream, 15 km from Dharamshala, the Chamunda Devi temple is a place that draws a steady stream of pilgrims around the year. Being a fearsome form of mother goddess, the shrine commemorates the goddess as a slayer of evil. The temple with holy water tanks in a picturesque valley is believed to be more than 700 years old. The small rock temple dedicated to goddess Durga as Kapaleshwari at Kunal Pathri is just 3 km from Dharamshala. Placed in the middle of a dense tea garden renders it ideal for an afternoon walking visit. Built over a fresh water spring, this temple commemorates a mythical agreement between demon king Bhagsu and snake god Nag. The truce has the snake god grant the demon rights to use water from his underground realm to irrigate his parched lands. The spring water flows into a pool where pilgrims do take a holy dip. The temple at a walkable distance is just 2 kms from Mcleodganj. The beautiful hill station is a preferred destination for international tourists and has some of the best eateries, restaurants and food joints, with most of them located in and around Mcleodganj. Just a few hundred meters above Bhagsunag Falls is the much visited Shiva Café. With a dreamlike setting in the middle of the woods, enjoy a drink or a meal listening to the ambient sound of flowing water mixed with some amazing acoustics. A Japanese vegetarian restaurant in McLeod Ganj is popular for its exotic menu that changes by the day. Dishes worth trying out here include the miso soup and kari. The Himalayan Tea Shop at Dharamkot is well known for the steaming hot cups of tea served with freshly prepared snacks that you’ll munch down in no time. A place which is popular in Mcleodganj for its quality food and the expansive sunny terrace. The hotel is also the preferred choice of stay for tourist during their escapade. The government run Zonal Hospital in the city is equipped to meet any medical emergency that a tourist may face while visiting Dharamshala. Facilities at the nearby Tanda Medical College, Kangra supplement the medical needs of those who need specialised care. The city also has some good private medical facilities that are open 24×7. Dharamshala is well connected by road to the major destinations of Shimla, Manali, Delhi and Chandigarh. It can be reached by public or private transport services. The town can also be reached easily by rail and air with the closest airport and railway station being at Gaggal and Kangra respectively. With the Dal Lake filled to the brim with fresh monsoon rain water, the Dal fair in Upper Dharamshala in August is a big draw. Natives, Tibetan settlers and tourists with many foreigners among them, turn the gathering into a cosmopolitan crowd who can be seen buying, selling, eating or simply merrymaking at the fair. Spread over 9 days, Navratras are holy days in accordance to the Hindu religious calendar that are celebrated twice in a year. The Chaitra (March/April) and Ashiwin (September/October) Navratri are celebrated all over the country where pilgrims visit temples to seek the blessings of the gods and goddesses. At the temples in and around Dharamshala as well as those across Kangra valley, special prayers are organised and free meals are given to all who pay a visit. The town is decorated and wears a festive look for the occasion. Best time to visit Dharamshala is from March through June in the summer and from December through February in winter with there being a good chance of witnessing a snowfall. For those who love the outdoors, Dhauladhar is excellent trekking country. 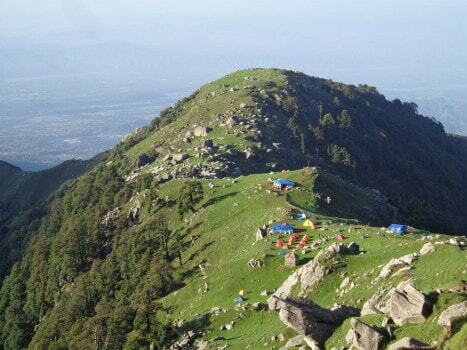 To enjoying stunning views of the vast Kangra valley a summer trek to Triund (altitude 2875 meter), just below the snowline is being up close to the spectacular peaks of the ‘white ranges’. Making way through thick oak and deodar forests with scattered rhododendron flowers in the path, this moderate trek starts at about 10 km distance from Mcleodganj. The last stretches of the trek are demanding as you make your way up the 22 gruelling curves to an open camping ground. The walk down is an easy run into the breeze. Dal Lake at a distance of 7.3 km from Dharamshala on the Mcleodganj to Naddi road is a quiet picnic spot besides the small lake (altitude 1,775 m) here. The area has a deodar tree forest cover from all sides and is marked by the Durveshwar temple on one side. Its setting makes for a pleasant afternoon escapade. At 2934 meters altitude, this mountain water body is a trekking destination in the Dhauladhars. Source of the shallow lakes water is snow melt. In the deep blue crystal clear water you can see the lakes bed at most places. 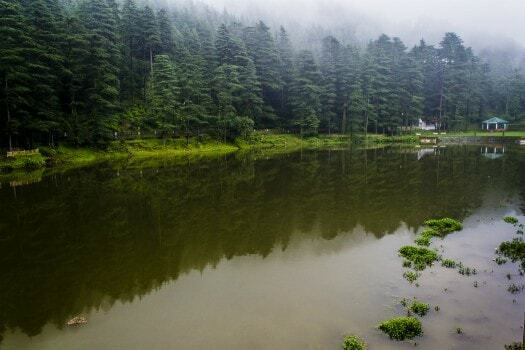 Kareri lake is at a distance of 9 km from Dharamshala. It also serves as a base for trekking further into the Dhauladhars and onward to Chamba. Indrahar Pass at an altitude of 4,342 meters is a demanding trek from Galu Devi Temple near Dharamkot village, Dharamshala. One can attempt to cross this pass that goes over some incredible terrain from April to October. View of Dhauladhars, Pir Panjal Mountains and Arthur’s Seat from the pass is spectacular. On the trek, camping at Lahesh Cave, a natural rock shelter, is a great experience .